So yes, like many, I love black. I also ADORE great cuffs and bracelets with presence. I wanted to design a black, wide, bold bracelet as a canvas to showcase select Nice jewelry pieces. The leather part was a bit tricky for me. I remember being a little kid and learning what leather was. I was so distraught. I’ll never forget my Dad explaining,”Honey, a cow never died for an $8 hide.” I still felt softly towards the leather and worried for the poor cows but I felt better about it. I do wear leather shoes; I do buy leather belts; I am NO vegan. (Easily quit milk yeeearsss ago and in August 2016 I slashed dairy drastically thanks to a pledge to myself and a friend at Burning Man and I’m so glad I did.) However/regardless/on with the story… I was a still pretty squeaky on the idea of pumping out Nice leather goods. Trying to figure it out, I found a leather scrap bin at SAS Fabric by the Pound – an incredible local “fabric store” (trust me the quotes are warranted) and I browsed through thrift shops for leather clothing too damaged for repair. The quality and beauty were really hit and miss, plus I would have had a lot of waste and it would have been impossible to standardize the look over time. I was only willing to source leather that was upcycled or rescued from the trash. I loved the idea of channeling funds to the Humane Farming Association and other great causes. I wasn’t finding what I needed, the project stalled and a few months passed. Bam! I met Pia Maria. Pia is a professional leather seamstress/tailor/artist extraordinaire. She’s famous for her motorcycle jackets in leather and denim. Check her out on Instagram. We became fast friends and months later, in a generous gesture and sweet compliment to my creativity she said “Here, these are yours – you’ll make something great.” I wish I had a scale to say how many scraps of leather she gave me. I couldn’t believe I hadn’t thought to ask for them before that, but it made it all the more special as a gift. Voila. Nice collaboration. Nice cuffs made with up-cycled scraps from Pia’s motorcycle vests and artfully sewn by the master herself. Shown here with a sterling silver boomerang, each cuff features the unique beauty and flow of Pia’s stitching. The lines curve back and forth for a subtle, gorgeous, artful statement. They’re backed in black denim and finished with a silver plated snap. The leather is lambskin. Yep. Just when you got used to the idea of a cow, you’ve gotta picture a little lamby. I know that they didn’t D-I-E for the hide – even at a lot more than eight bucks a lamb. Lambs. Favorite animal? One of them, for sure. When I say I had an Americana childhood I’m not blowing smoke. As a kid, I bottle fed lambs many times and experienced first-hand their lovey faces, begging bleats and how they follow you around so sweetly. So. I squeaked a little bit all over again, over the lambskin. But. These are beautiful. And rescued and lovingly artfully crafted leather cuffs. Bless those little lamb’s hearts you can choose “Humane Farming” as your Nice 33% beneficiary and your cuff will even change the lives of lambs. So. Along with lambs, bold cuff bracelets, creative collaborations and the color black… another of my favorite things in this world is performing as a fire dancer. I thrive when I’m dancing with fire to music I love, at venues and events I enjoy, often benefitting organizations I admire. Thus, the launch in tandem with a fire performance for the opening of the Erotica Art Exhibition, benefitting the Sculpture Resource Center. 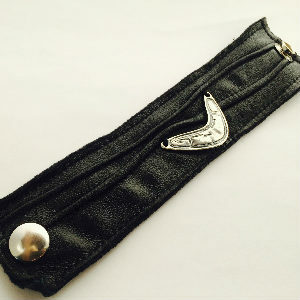 What could be more fitting than launching the black leather cuff in a fiery, fierce, fun, naughty and nice debut? And what could be better than collaborating with wise, fun, talented friends? Thanks to Pia for bringing the Nice leather bracelet dream to life and to all you Nice people out there, balancing a golden karma life in black leather style.